Since 1991 I have been a member of the Association of Craft Masters as a Master jeweller and engraver. From the beginning of the 90s I have been engaged in manufacturing knives - mainly hunting - in my arms company “GRIFON”. 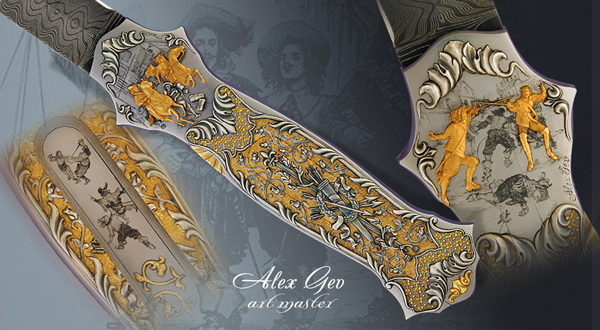 Since 2008 I have been making and engravingfolding knives full-time under the name Alex Gev. For me this is a creative process - inspiration and love, based on my knowledge of metals, mechanics, physics, chemistry, and the experience gained in my company in the construction of different mechanisms for improving weapons with precision craftsmanship. Every knife I make is a unique combination of mechanism and design appropriate to the artistic theme.